The Rainbow Herbicides are a group of "tactical use" chemicals used by the United States military in Southeast Asia during the Vietnam War. Success with Project AGILE field tests with herbicides in South Vietnam in 1961 and inspiration by the British use of herbicides and defoliants during the Malayan Emergency in the 1950s led to the formal herbicidal program Trail Dust (see Operation Ranch Hand). Herbicidal warfare is the use of substances primarily designed to destroy the plant-based ecosystem of an agricultural food production and/or to destroy foliage which provides the enemy cover. The United States discovered 2,4-dichlorophenoxyacetic acid (2,4-D) during World War II. It was recognized as toxic and was combined with large amounts of water or oil to function as a weed-killer. Army experiments with the chemical eventually led to the discovery that 2,4-D combined with 2,4,5-trichlorophenoxyacetic acid (2,4,5-T) yielded a more potent herbicide. It was found that 2,4,5-T was contaminated with 2,3,7,8-tetrachlorodibenzodioxin (TCDD), commonly called "dioxin". Researcher Alvin Lee Young found that samples of 2,4,5-T in Agents Pink and Green had doubled the TCDD concentration of Agents Purple or Orange. Agent Orange II:50% n-butyl ester 2,4-D and 50% isooctyl ester 2,4,5-T used after 1968. Agent Orange III: 66.6% n-butyl 2,4-D and 33.3% n-butyl ester 2,4,5-T. Enhanced Agent Orange, Orange Plus, or Super Orange (SO), or Doe Herbicide M-3393: standardized Agent Orange mixture of 2,4-D and 2,4,5-T combined with an oil-based mixture of picloram, a proprietary Dow Chemical Company product called Tordon 101, an ingredient of Agent White. 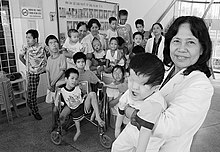 Professor Nguyen Thi Ngoc Phuong, at Từ Dũ Obstetrics and Gynecology Hospital is pictured with a group of handicapped children, most of them victims of Agent Orange. In Vietnam, the early large-scale defoliation missions (1962-1964) used 8,208 gallons of Agent Green, 122,792 gallons of Pink, and 145,000 of Purple. These were dwarfed by the 11,712,860 gallons of Orange (both versions) used from 1965 to 1970. Agent White started to replace Orange in 1966; 5,239,853 gallons of White were used. The only agent used on a large scale in an anti-crop role was Blue, with 2,166,656 gallons used. The bombardment occurred most heavily in the area of the Ho Chi Minh Trail. The Rainbow Herbicides damaged the ecosystems and cultivated lands of Vietnam, and led to buildup of dioxin in the regional food chain. About 4.8 million people were affected. In addition to testing and using the herbicides in Vietnam, Laos and Cambodia, the US military also tested the "Rainbow Herbicides" and many other chemical defoliants and herbicides in the US, Canada, Puerto Rico, Korea, India, and Thailand from the mid-1940s to the late 1960s. Herbicide persistence studies of Agents Orange and White were conducted in the Philippines. The Philippine herbicide test program which was conducted in cooperation with the University of the Philippines, College of Forestry and was also described in a 1969 issue of The Philippine Collegian, the college's newspaper. Super or enhanced Agent Orange was tested by representatives from Fort Detrick and Dow chemical in Texas, Puerto Rico, and Hawaii and later in Malaysia in a cooperative project with the International Rubber Research Institute. Picloram in Agent White and Super-Orange was contaminated by Hexachlorobenzene (HCB) a dioxin-like carcinogen. The Canadian government also tested these herbicides and used them to clear vegetation for artillery training. A 2003 study in Nature found that the military underreported its use of rainbow herbicides by 2,493,792 U.S. gallons. Vietnam remains heavily contaminated by dioxin-like compounds, which are classified as Persistent Organic Pollutants. These compounds remain in the water table and have built up in the tissues of local fauna. However, the contamination has begun to deteriorate, and the forest canopy has regrown somewhat since the Vietnam War. Dioxins are endocrine disruptors and may have effects on the children of people who were exposed. Soldiers exposed to Rainbow Herbicides in Southeast Asia reported long-term health effects, which led to several lawsuits against the U.S. government and the manufacturers of the chemical. ^ a b c d e f Ornitz, Sheri L. "Agent Orange and its Continuing Effects". British Travel Health Association Journal, vol. 10. Winter 2007. ^ a b c d e Alvin L. Young. The History, Use, Disposition and Environmental Fate of Agent Orange. Springer. p. 34. ISBN 978-0-387-87486-9. ^ Stellman, Jeanne; Stellman, Steven D.; Christian, Richard; Weber, Tracy; Tomasallo, Carrie (17 April 2003). "The extent and patterns of usage of Agent Orange and other herbicides in Vietnam" (PDF). Nature. 422 (6933): 681–7. doi:10.1038/nature01537. ISSN 0028-0836. PMID 12700752. ^ a b Committee to Review the Health Effects in Vietnam Veterans of Exposure to Herbicides; Institute of Medicine (1994). Veterans and Agent Orange: Health Effects of Herbicides Used in Vietnam. National Academies Press. pp. 89–90. ISBN 978-0-309-55619-4. ^ Stephen Bull (2004). Encyclopedia of Military Technology and Innovation. Greenwood Publishing Group. p. 6. ISBN 978-1-57356-557-8. ^ Daniel Vallero (2011). Biomedical Ethics for Engineers: Ethics and Decision Making in Biomedical and Biosystem Engineering. Academic Press. p. 73. ISBN 978-0-08-047610-0. ^ "Herbicides" entry in Spencer C. Tucker, ed. (2011). The Encyclopedia of the Vietnam War (2nd ed.). ABC-CLIO. ISBN 978-1-85109-961-0. ^ a b Wright, Laura. "New Study Finds Agent Orange Use Was Underestimated". Scientific American, April 17, 2003. ^ "Herbicide Tests and Storage in the U.S." Department of Veterans Affairs. Retrieved 16 June 2010. ^ "Herbicide Tests and Storage Outside the U.S." Department of Veterans Affairs. Retrieved 16 June 2010. ^ Pelletier, Richard. "Agent Purple Deadlier than Agent Orange." Bangor Daily News, 1 July 2005. "Update #1 to INFORMATION PAPER Agent Orange/Agent Purple and Canadian Forces Base Gagetown" Department of Defense, Veterans and Emergency Management; Maine Veterans’ Services. February 9, 2006. Herbicidal Warfare Vietnam 1961-1971. oneofmanyfeathers.com 2/1/2014.